As the heat draws you indoors, you may find yourself itching for a room revamp, and the hearth provides plenty of opportunities to enter into your decorating equation. So you may not be lighting up a roaring fire anytime soon, but that doesn’t mean you have to ignore your fireplace until fall. 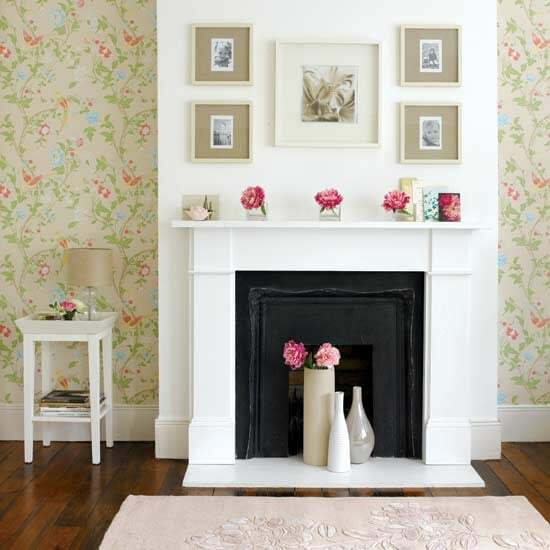 As the heat draws you indoors for the summer, you may find yourself itching for a room revamp, and the hearth provides plenty of opportunities to enter into your decorating equation. As a room focal point, fireplaces naturally draw the eye. So take advantage of the attention for a standout centerpiece that will take some of the sting out of the heat. 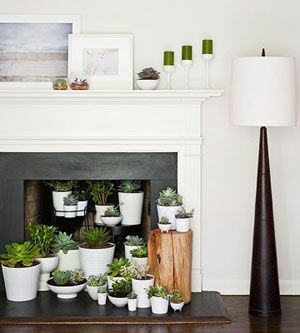 An unused open hearth grate offers an ideal spot for a midsummer’s cluster of candles—which, when lighted, add a dreamy, soft light to your living room ambiance. No grate in your fireplace? A sleigh-style iron candle holder will work just as well in a pinch. Perfect for a romantic summer evening! 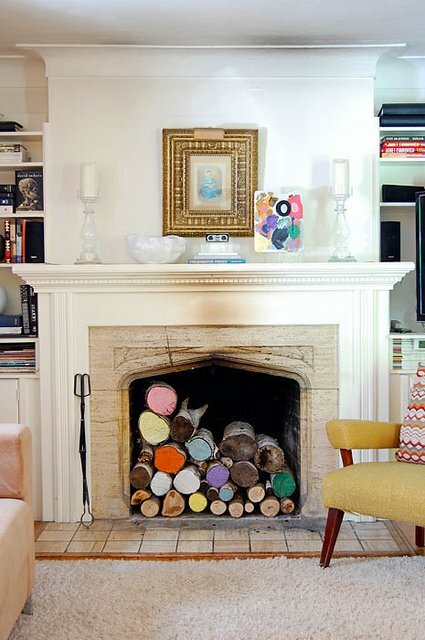 Fill an unused fireplace with stacked logs and it suddenly takes on a cheerful, serviceable demeanor. Add a pop of bright color to the ends of those logs and you’ve got an eye-catching statement piece with just the right amount of whimsy. Painted logs is an easy way to infuse ordinary objects with a designer’s eye, transforming your summertime hearth into a virtual work of art. One reason to look forward to summer is for all the gorgeous, heady blossoms cramming gardens with bright color and fragrant scents. To accommodate your garden overflow, snip off a few of the heavier flowers and slip them into tall glass vases stashed beside the fireplace. Or try a few ferns or succulents in front of the screen if you’re worried about spills. Got a few leftovers from a window replacement project? Well, now’s your time to put them to use! An outdated window sash or leftover shutters destined for the trash are all the ingredients you need for these clever repurposing projects. 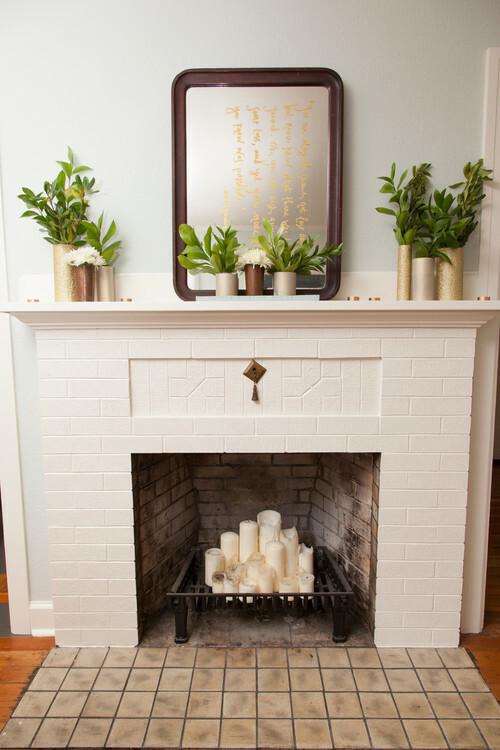 Use a glass etching kit to take your design even further, or just leave it at classic white—either way, you’ll get a first-rate summer screen for your fireplace for pennies on the dollar. Win win! Here’s an easy way to draw the eye to your favorite pieces. By adding artwork in front of the fireplace frames the work, you’ll make the ultimate impression on anyone who happens by. Extend up the wall to the chimney and you’ll have your own summertime gallery, curated exclusively by yours truly. Who cares how hot it gets outside? With decor this chic, you won’t want to leave the indoors anytime soon!